was never ratified, and that, as the ratifications o tie (0 ^ e ^ 1 ^ , ? existed for many years. ^ , , ,1 , . could not be, and never had been, recognised by Great Britain. protection, and the leading sheikhs stipendiaries of the British Government. 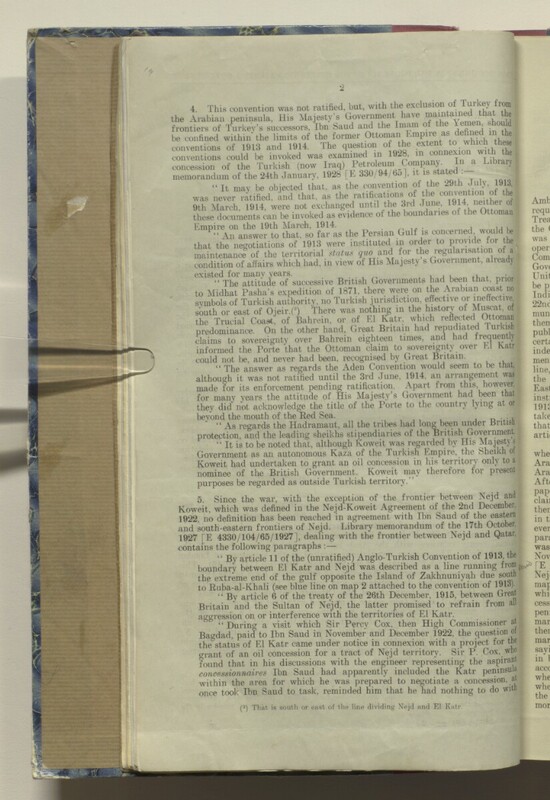 purposes be regarded as outside Turkish territory. and south-eastern frontiers of Nejd. Library memorandum of the 17th October. to Ruba-al-Khali (see blue line on map 2 attached to the convention of 1913). aggression on or interference with the territories of El Katr. ( 2 ) That is south or east of the line dividing Nejd and El Katr.